A MAN HAS been arrested after the Criminal Assets Bureau (CAB) seized a number of goods, including cash, cannabis and cars, during 21 searches in five counties. The searches took place this morning in Louth, Meath, Cavan, Monaghan and Dublin, targeting the proceeds of organised crime. 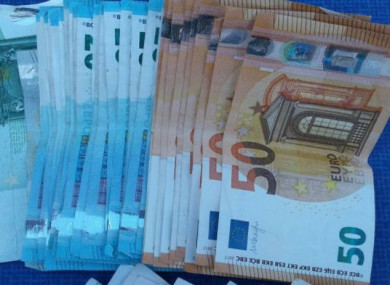 During the course of this morning’s searches, gardaí seized around €27,800 in cash and £1,570 sterling. Two stolen caravans, one Mercedes Benz car, a number of strimmers and lawn mowers, and a Rolex watch were also seized. Finally, gardaí seized cannabis herb and cocaine, which are subject to analysis, with a street value of approximately €1,000. Gardaí said a number of documents and mobile phones are currently being examined. “A freezing order has been made on a substantial sum of money in a financial institution,” gardaí said. One man has been arrested in connection with the investigation. Email “Man arrested after €27.8k, drugs, car and designer watch seized in CAB searches”. Feedback on “Man arrested after €27.8k, drugs, car and designer watch seized in CAB searches”.